Visual Crossing extends its commitment to the SAP platform with support for the latest Lumira product line additions including Lumira Discovery and Lumira Designer. Visual Crossing Maps for SAP Lumira empowers users to create and deploy powerful, interactive maps for use throughout the Lumira platform. Following the official release of the latest additions to the SAP Lumira product line, Visual Crossing has announced support for Lumira Discovery and Lumira Designer as part of a major upgrade to the Visual Crossing platform. Visual Crossing Maps for Lumira empowers users to create and deploy powerful, interactive maps for use throughout the Lumira platform. In addition, Lumira Designer allows users to share ad-hoc and production-quality maps via the Business Objects enterprise platform. Visual Crossing has been a leading provider of business mapping for nearly 15 years. By providing sophisticated mapping services to Fortune 500 companies, global enterprises, and many other organizations both large and small, Visual Crossing became the premier mapping tool for users that value the additional insight that spatial analysis can bring to their valuable business data. Since its inception Visual Crossing has created a series of products designed to bring powerful mapping technology to more users on more diverse platforms. This effort has produced deep integrations with industry standard tools such as Microsoft Excel, MicroStrategy, and SAP platforms including Lumira and Business Objects Design Studio. 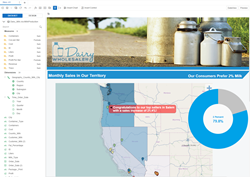 As a member of the beta program for SAP Lumira Discovery and Designer, Visual Crossing has taken the lead on ensuring that their mapping platform is fully ready and tightly integrated as users make the transition to new products and versions. Visual Crossing Maps for SAP Lumira features numerous, industry-leading firsts. It includes built-in, automatic address geocoding; custom shape layer support; and automatic region and territory creation based on analysis of the underlying business data relationships. This is all done directly within the Lumira interface and provides the easiest and quickest path to achieving presentation-quality maps and geospatial visualizations. Not only does Visual Crossing produce the most capable maps available on the SAP Lumira platform, it is priced to be affordable for every customer. Licensing options range from individual user licenses for a little as $10 per month to unlimited, enterprise-wide deployment packages. “Our cloud-based implementation allows Visual Crossing to support individual users and small teams with the same technology that is used by Fortune 500 companies,” said Andrew Wigmore, Director of Product Development at Visual Crossing. Visual Crossing’s investment in cloud technology enables a zero-footprint solution for smaller teams without sacrificing functionality and performance. When desired, larger departments and corporate enterprises can host the Visual Crossing platform onsite for optimal security and flexibility. For more information about Visual Crossing for SAP Lumira please visit http://www.visualcrossing.com/sap. A free trial of the extension is available after which there are monthly, annual, and enterprise licensing options available. Visual Crossing for SAP Lumira combines the power of Visual Crossing’s proven, enterprise-grade mapping technology and the breadth of SAP’s Lumira analysis platform. Map extensions on Lumira Discovery and Lumira Designer enable robust analysis for single users, teams, and enterprises via the SAP Business Objects platform. Available in the SAP App Center as a free trial and in various affordable packages, Visual Crossing for SAP Lumira sets the standard for ease-of-use and geospatial analysis on the SAP platform. For more information and to see a demo, please visit http://www.visualcrossing.com/sap. Founded in 2003, Visual Crossing Corporation is the technology leader in mapping integrations for business data solutions including SAP, MicroStrategy, and Microsoft Office. With expertise in both data analysis and mapping systems, Visual Crossing is uniquely positioned to bring together the best of both disciplines. For more information and to see a demo, please visit http://www.visualcrossing.com. Visual Crossing, Visual Crossing for SAP Lumira, and Visual Crossing Map Services are trademarks of Visual Crossing Corporation. Other company and product names may be trademarks of their respective owners.